I became a mommy early last month. Yes we have a 2-year-old in our home. My husband and I decided we wanted to adopt. But while we wait for the child God has for us, we chose to foster and take care of the little munchkins that need us and need love. We were approved on May 1st and on May 10th we were officially foster parents. The little boy who came to our home did not eat solid foods. He was use to drinking his food. He couldn’t speak, mimic, or play like other two-year olds. He was extremely delayed and didn’t like to look at you in the eyes. He walked with his feet turned in. He was on the border of being diagnosed with autism because of some of his repetitive play habits and poor social and communication skills. I’ve learned that children with autism can reverse their symptoms completely with the right nutrition. That means no gluten and no dairy. Well there you go…I’m gluten and dairy free too. I don’t think it was a coincidence that he came to my house. I truly believe that everything I’ve gone through has prepared me for this very moment. The 1st couple of weeks I fed him everyday (yucky) foods because I was just trying to get him to eat. I was frustrated and didn’t know how I was going to help him if he didn’t eat. So yes, I bought ready-made pancakes, and chicken nuggets at the supermarket (I’m not proud of that). I did whatever it took to attract him at food time. I did however sneak tons of veggies in his smoothies and he loved thoae. After the first 2 weeks it dawned on me that if I didn’t practice what I preached at My Clean Cutting Board, everything I went through was in vain. I began to really focus on changing his diet like I changed mine. I asked his day care director if I could provide his food because I needed him to be gluten and dairy-free. She said no because he was badly malnourished and the Department of Children and Families had to be involved in everything that he ate. She did however let me bring coconut milk so that he could drink it instead of the cow’s milk. I was satisfied with that. Now I feed him a gluten-free breakfast at home before we go, and feed him a gluten-free dinner at night. I add lots of healthy snacks and smoothies in between. So the only meal he is having gluten in is lunch. And thanks to the coconut milk smoothies I send he’s not having dairy at all. How does he get his calcium you ask? I put lots of kale and spinach in his smoothies and he eats raw sprouted almonds everyday as a snack. Top it off with a multi vitamin from my functional medicine Dr. and voila. Well let me tell you how much he’s changed. He now mimics some things you do. So if I clap, he will too. When we kiss him, he will kiss back. He smiles when we smile at him. His feet are now turned out. He gives us his hand when we say “gimme five.” He looks at us in the eye and understands what we say. He comes when we call him. He’s extremely obedient and loves to hug. He is the most affectionate little boy I know. All the girls in church swoon over him because he goes with everyone. He has completely changed from the first evaluation. I am still trying to get him to say simple words like mama and papa and ABC. But that will come soon. I just know it. He has a great team with his day care, case workers, therapist, and foster parents. I know he will be just fine. He arrived at 24 lbs and in just 1 month he must be close to 30. He is growing inside and out. He hasn’t been diagnosed but I’m confident that the nutrition will change the outcome that everyone is expecting. I’m kind of excited and hoping to help heal more children with nutrition. Nutrition is such an important part of a child’s development. Don’t ruin it with chips, processed foods, and sugary drinks. If you don’t give it to them they won’t want it. You know more than they do. If your child has autism and someone tells you that you can help slow down or even stop the symptoms with nutrition why wouldn’t you at least try? It won’t be over night but if they are young it may only take a few weeks of strict changes to see a difference. At least in my case it did. If you really love them you won’t give up. I make him veggie smoothies to take to day care. 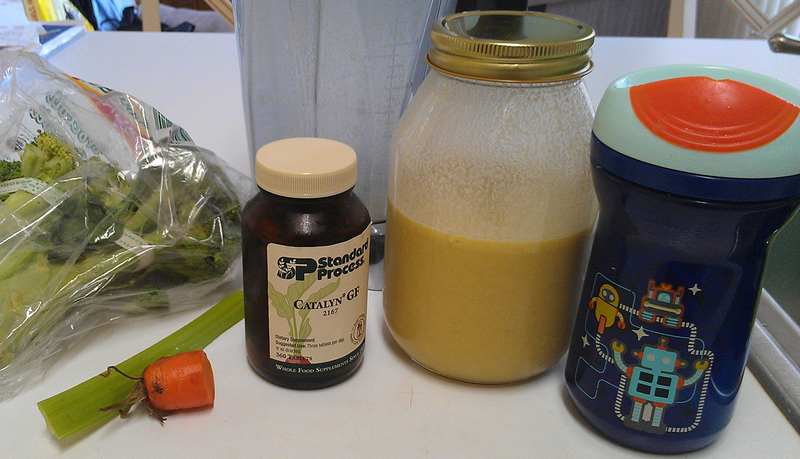 This morning was celery, carrot, and broccoli with coconut milk, banana, and almond butter. I also add a multi-vitamin and probiotics to the mix. I think it’s delicious. Of course the Vitamix helps pulverize all the chunks so it’s easy to drink too. If you don’t have one you’re missing out. I have not followed your blog long, but from this post, I can see that you are an amazing person to open up the doors of your home to love and care for a child who desperately needs affection, compassion and proper nutrition. Congratulations on becoming a parent! It sounds like you’re already a wonderful parent, healing his heart and his body. Thank you Connie. That is so sweet. I’m actually just a regular girl. I just let God use me whenever he wants.